Has anyone ever heard previous papal teaching suggesting that when the Lord appears to be angry with his disciples that He was only 'pretending'? It is a strange thing for the Vicar of Christ to say and opens up a range of questions regarding when Our Lord was being serious with His disciples and when He was 'pretending'. My understanding of Church's understanding of the Gospel accounts of the Lord Jesus and His interaction with His Apostles and disciples was that there was no pretense in Him. There was nothing fake, deceitful or anything that could be interpreted as 'pretense' in the Lord Jesus Christ. Not before all ages, no then, not now, not ever. For if the Lord 'pretended' to be angry at times in His ministry on Earth, what else would He have 'pretended' to His Apostles and disciples? I guess if you are to accept that Christ could be angry, and demonstrably so, it does rather shove the message that the Catholic faith is all about fluffery lovery-dovery down the pan. The temptation to refashion Christ into the image of one's own making is not only misguided but dangerous. This strikes me as being a little too much like Gnosticism - that the true message of Christ's teaching already requires one to possess some secret knowledge with which to unlock it. We've heard about your sort, you are clearly a Promethean neo-Pelagianist. Sounds like a lot of fuss over nothing again. Quibble, witter, more quibble! We must pray for the Church as we endure the Great Apostasy. I cannot think of a single example in the Gospels of Our Blessed Lord being described as "angry" with his disciples. Indeed it is hard to think of an instance from which it might be inferred that he was angry with them...somewhat exasperated perhaps... but nothing more. Might not this refer to when He said to Peter, "Get behind me, Satan,"? That sounds to me like rhetorical exaggeration but not anger. Could this be a translation problem? 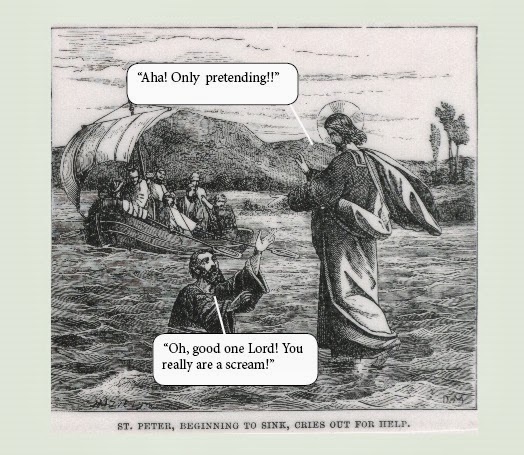 To suggest that Jesus was 'pretending' is blasphemous on its face. God help our Church. Barbara Jensen writes: "To suggest that Jesus was 'pretending' is blasphemous on its face." This is disgraceful. Pope Francis has been a priest for nearly 44 years (December 13), a bishop for 21 and a cardinal for 12. What qualifies Barbara to pass such a judgement. Especially when there is no way from this post of knowing exactly what the Holy Father said and the context in which he said it? Especially bearing in mind that I, like Patricius, can recall no instance in the Gospels where Jesus is described as bein "angry" with the apostles/disciples. There is a "way from this post of knowing exactly what the Holy Father said and the context in which he said it": click the link in the post. BTW, did you ever read some of the sermons Cardinal Bergoglio gave when he was Archbishop of Buenos Aires? Neither a cardinal nor a pope can invent his own magisterium. Perhaps a Spanish reader can confirm that this was indeed the original meaning. We must not presume that an English translation of the Pope's words is correct and start panicking! That's nothing; Francis has many more important new teachings for us. When a Pope, in an apostolic exhortation, demonstrates his ignorance of the greatest commandment shouldn't the faithful rise up and oppose him? I think we are in danger of becoming a little paranoid in interpreting the Pope's words. So the Holy Father is NOT 'demonstrating his ignorance' but quoting directly from St John here. This is for Hughie. Pope Francis made the remark that 'Jesus was only pretending' to be angry with His Apostles. Are you suggesting that there were times when Jesus was duplicitous? Jesus is God and is Truth. He Himself told us to let our speech be 'Yes! Yes! and No! No! Anything else is from the evil one.' Where this man said that Jesus was pretending can easily be found if you go back and read the article upon which these comments are a response. Your argument is that Francis is a cardinal and bishopo. So what? Truth is Truth, and TSruth is God. No one has the right ot suggest that Christ was, upon occasion, duplicitous. This pope continues to confuse and to confuse. No, you are wrong, I didn't say the quote was inaccurate. Pope Francis is not simply quoting John. He introduces that quote as being the first and greatest commandment when it is not. The quote is accurate but his description is not. It is a serious and telling mistake that Francis thinks love of neighbour is the greatest commandment rather than love of God. It ought to jar very strongly with the sense of the faithful. “In the Gospel, Jesus DOES become angry, but pretends to when the disciples do not understand him." As this sentence makes no sense at all, I think it is more likely that defective reporting is what is happening here. IF the original reports were accurate I would be tempted to ask the Holy Father how he knew that Jesus was not just joking around when He said: "Thou art Peter, and upon this rock..."??? However, I am sure Pope Francis does not believe that Our Lord was "pretending" on the road to Emmaus so will refrain from such impertinence. I have said repeated in the past that this pope is not the best when it comes to speaking and being a Jesuit makes things worse. Most of the other news about him are still about his AE that was released last week. The Pope Emeritus was a clear and precise speaker whose whole theology was Biblical so he would not EVER say something so dumb.